Thurmont Middle School was well represented at the Frederick County Public Schools Technology Fair. 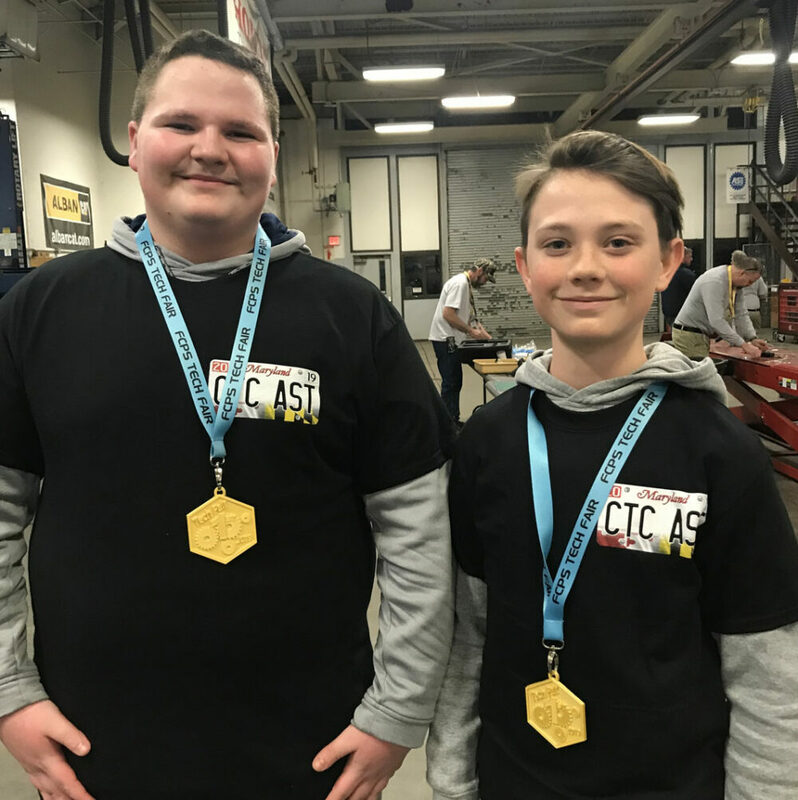 The competition took place at The FCPS Career and Technology Center (CTC) on February 25, 2019. Two eighth graders, Josh Aubol and Maceo Zelenka, designed and built the fastest hovercraft at Thurmont Middle School. They built the hovercraft as a project in Problem Solving class. Because of their creative engineering and consistently reliable hovercraft, Josh and Maceo were selected to represent Thurmont at the FCPS Technology Fair. The two competed against teams from other Frederick County middle schools, twelve teams in all, with most of the county middle schools represented. Again, the duo prevailed. Their hovercraft, which they named Le Frog, was the fastest, and they won first place. The boys were awarded 3-D printed medals that were designed and created by CTC students. Josh and Maceo were also presented with t-shirts from the current Automotive Service Technology program students. Since they won the FCPS Tech Fair, they now qualify to compete at the state level at The Baltimore Convention Center this spring. Josh Aubol and Maceo Zelenka, eighth grade students at Thurmont Middle School, are selected to compete at the FCPS Techology Fair with their built hovercraft.